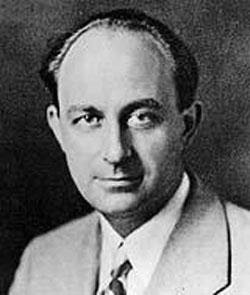 Enrico Fermi, the first atomic reactor designer who was born in 1901 in Rome, Italy. By the age of twenty-six years he had become a full professor at the University of Rome. And while he had published major papers, one of which branch of physics that deals with difficult and deep-called "quantum statistics." In this paper, Fermi developed the statistical theory used to describe the behavior of particles in bulk unification of separate, the kind that is now referred to as "fermions." Because the electrons, protons and neutrons - three "cluster structure" consisting of ordinary objects - all of which "fermions." Fermi theory has very important significance for science. This statement opens the possibility we have a better understanding about the subject of atomic nuclei, about the degradation behavior of an object (such as occurs on the inside of some kind of stars), and the elements of contained metal properties. This is clearly a subject matter that has a lot to. In 1933 Fermi postulated the theory of the "slump beta" (a type of radioactivity) that associates the first quantitative discussion about "neutrinos and weak interactions," two important topics in physics today. Such investigations, although not easily understood layman, put Fermi as one of the world's leading physicists. However, the most important work of Fermi not yet emerged. In 1932, an English physicist James Chadwick, has managed to find the name subatomis particles: neutrons. Starting from 1934, Fermi continued by sending a stream of high speed particles of atoms with neutrons. Experiments show that many types of atoms capable of absorbing neutrons, and in many cases the atoms resulting from the conversion of this kind containing radioactive nuclear. People rightly expect that it would be easier for neutron seeping into the main part of the atom when a neutron moving at high speed. However, Fermi experiments showed the opposite of that. That is, when a fast neutron lowered first by making him pass through the "paraffin" or water, it can be more readily absorbed by the atom. This discovery is very important in the use in the construction of nuclear reactors. The materials used in the reactor to make slow motion in neutrons known as the "moderator." In 1938, Fermi important investigations on neutron absorption making it received the Nobel Prize in physics. But, along with that he has trouble in Italy. First, Fermi's wife was Jewish while the Fascist government in Italy have issued a number of laws that anti-Jewish tone. Second, a Fermi berfaham persistent anti-fascist, an attitude that is very dangerous when Italy under Mussolini dictator. In December of 1938, when he went to Strockholm to receive the Nobel Prize, he did not return to Italy, but went to New York. Erratic course, Columbia University can prance experts one of the scientists in the world. Not thinking, Fermi immediately available position. Fermi become American citizens in 1944. In early 1939, it was reported by Lise Meitner, Otto Hahn and Fritz Strassmann absorption of neutrons that sometimes causes the uranium atoms to be separated. When news reports broke, Fermi (as well as some leading physicists) soon realized that pisahnya separate uranium atoms can release enough neutrons to start the chain reaction. Furthermore, Fermi (also with other physicists) immediately see and imagine the military potential that could be generated by this chain reaction. By March 1939, Fermi had contacted the U.S. Navy and tried to interest them in the fabrication of atomic weapons. However, only a few months later, after Albert Einstein wrote a letter on the subject to President Roosevelt, then the United States government concerned with atomic energy. Once the United States are interested, the task of the most important scientists are building a prototype tool to oversee the release of atomic energy to see if the chain reaction that could hold its own can actually be accounted for. Because a scientist Enrico Fermi and authorities weighs in Happenings neutrons, and because he combines both theory and practical talent experiments, he was appointed head of the group to try to build the world's first atomic reactor. First he worked at Columbia University, then at the University of Chicago. In this Chicago, dated December 2, 1942, a nuclear reactor was completed successfully designed and built under the supervision of Fermi. This is truly a first round of the atomic era, because for the first time in human history people managed to create a nuclear chain reaction. Successful trials were sent to the east with the magic words but contain hidden images, "the Italian Navigator has set foot in the new world." After successful events this experiment, it was decided to rush forward as quickly as possible through the so-called "Manhattan Project." Fermi continued decisive role in the project as an expert advisor that stands out. After the war, Fermi so professor at the University of Chicago. He died in 1954, married and childless Fermi two. Chemical element number 100, "fermium," dubbed his name as a mark of respect. Fermi is a key person judging from any cause and the majors. First, no doubt he is the greatest scientist in the 20th century and one of the few famous both as a theorist and experimentalist. There is very little scientific work unfolded in this book, but Fermi is already written more than 200 scientific articles during his career. Second, Fermi is a very important figure in relation to the fabrication of an atomic bomb, although some others hold equal importance role in the work. However, the significance of most basic Fermi stems on which he held key roles in the discovery of atomic reactors. Obviously Fermi share in this relationship. He gave a decisive contribution theory, and he supervised its design and construction as well as the first reactor. Since 1945, no atomic bomb used in warfare, but a large number of nuclear reactors built for nuclear energy for peaceful purposes. These reactors would have seemed even more important meaning in the future. More than that, some of the reactors used to memprodusir useful radioisotopes, which are used in medicine and scientific inquiry. Reactor is also - and more frightening - a source of "Plutonium," the main ingredient (substance) that can be used to make atomic weapons. There is an understandable fear that a nuclear reactor could be catastrophic for humanity, but no one considers that the discovery bagatelle. Whether for good or for evil, the work of Fermi would have far-reaching impact on the future.